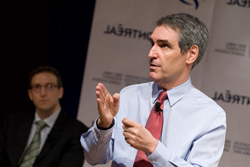 The HEC Montréal MBA students association (AEMBA) today met with Michael Ignatieff, leader of the Liberal Party of Canada, who came to the School to speak to students and outline his party’s position concerning the country’s economic situation. In an informal discussion with the audience composed of some 475 persons, the Leader of the Official Opposition first explained the conditions that the upcoming federal budget on January 27 will have to meet if it is to be supported by Liberal MPs. He then answered students’ questions and talked with them about their main concerns and questions regarding economics and government finances. The goal of the HEC Montréal MBA students association (AEMBA) is to encourage excellence, initiative, social networking and a sense of belonging among its 150 full-time students and all its part-time students. 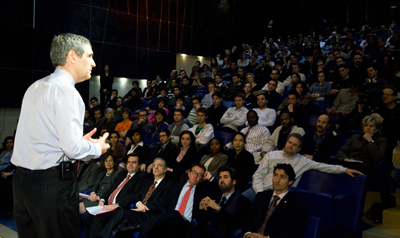 The AEMBA represents and defends students’ interests in dealings with HEC Montréal authorities. In co-operation with the School, it provides different educational and professional support services to help members integrate the job market. The Association also offers many different activities so that students can have fun, make new friends and prepare themselves for their professional careers.